Sugar Cookies with Raspberry Cream Cheese Frosting are a delightful twist on the original sugar cookie. 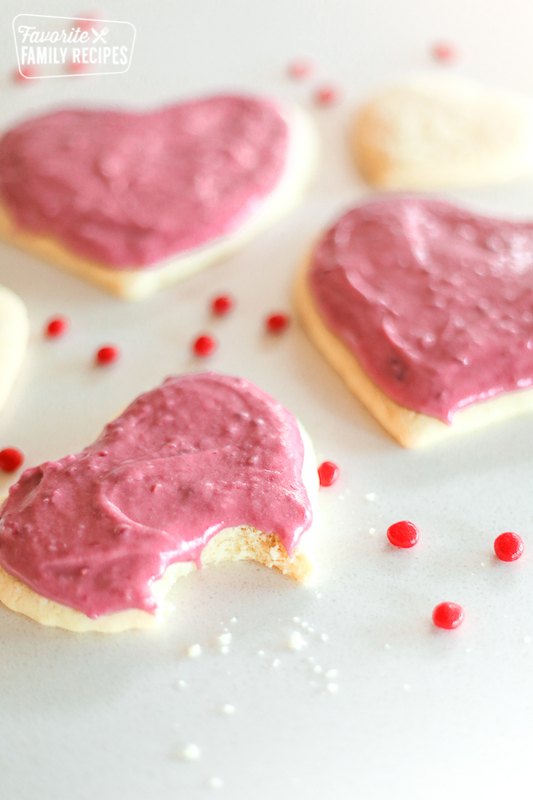 Soft, buttery cookies topped with vibrant raspberry frosting is the perfect way to celebrate your loved ones! Sugar cookies are practically a staple in our house from December through February (and all through the rest of the year if I’m being honest). Christmas lends itself to whimsical sweets, and we like to keep that tradition going through Valentine’s Day, along with many of our other favorite Valentine treats. 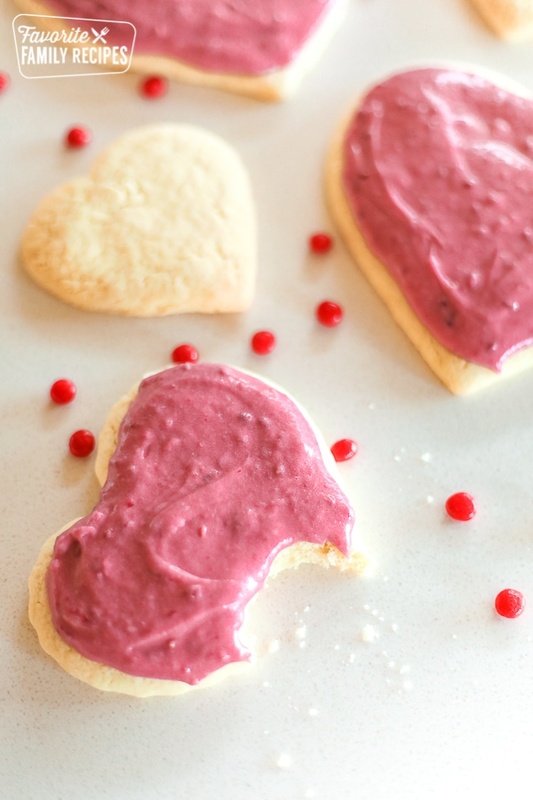 To switch it up a bit, we top our heart shaped sugar cookies with a sweet and tangy raspberry cream cheese frosting that will absolutely knock your socks off! The fruit creates a natural pink color perfect for this time of year, and is a delicious variation to our classic Cream Cheese Frosting recipe. 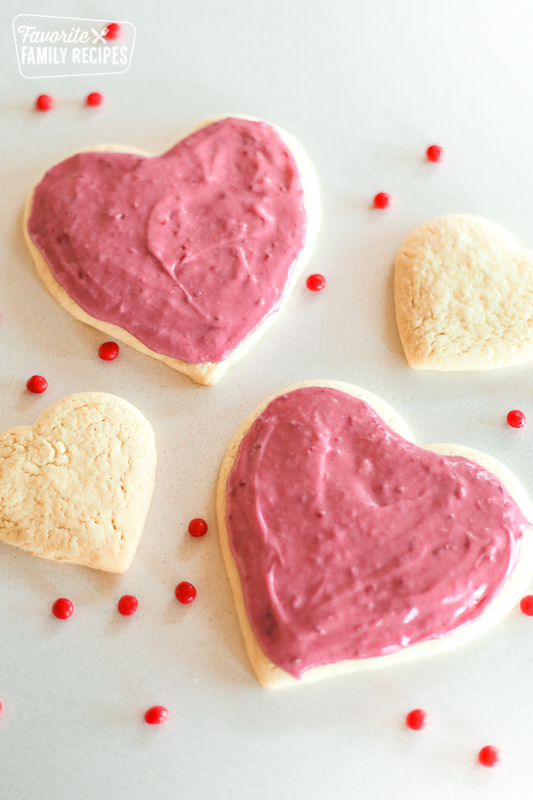 Your sweethearts young and old will all adore these cookies! If you do any baking at all, you probably have all the items to make this classic sugar cookie recipe right in your pantry already. No fussy or unusual ingredients here! Just butter or margarine, sugar, salt, baking powder, baking soda, almond or vanilla extract and flour. That’s it! 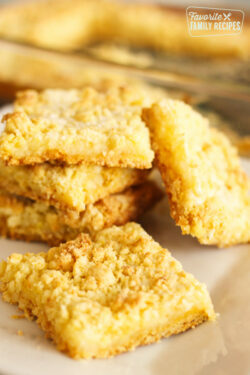 These homemade sugar cookies come together in a snap! And this recipe is so versatile, you can use it over and over again to create goodies for every occasion. The Raspberry Cream Cheese Frosting is the star of the show! It is such a treat, you’ll love it! And it’s really simple to make. The raspberries turn the frosting a glorious shade of pink. It’s something to behold! It is all natural – no food coloring here. The thickness of the frosting is up to you. This is kind of a delicate dance, where you’re the leader. If you want the frosting thicker, add powdered sugar a little at a time. If you want the frosting thinner, add some of the drained raspberry juice a little at a time. Be sure to start with ROOM TEMPERATURE butter and cream cheese. 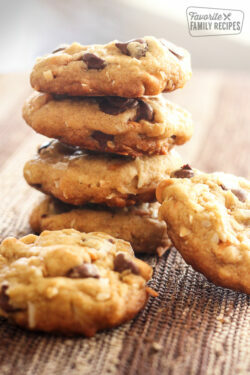 If you’re a fan of soft, chewy cookies don’t over bake! Start the cookies out in the oven for about 8-10 minutes, and then check on them. If you prefer a crispier cookie, roll them thinner and extend the baking time slightly. Try other kinds of berries in the frosting! Blueberries, strawberries or blackberries blend perfectly with cream cheese to create decadent, dreamy icing with beautiful natural colors. After frosting your cookies you may have some icing leftover. If you’re like me, you’ll be more than happy to sample some with a spoon, but you can also store it in the refrigerator for a couple of weeks. It’s never lasted that long in my house, but theoretically it will stay fresh for that long in the fridge. I like to make a big batch of these cookies and freeze them unfrosted. You can keep them in the freezer for up to three months. After they’re frosted and kept on the counter, they’ll stay nice and fresh for a few days. Make sure to keep them in ziplock bags or an airtight container. 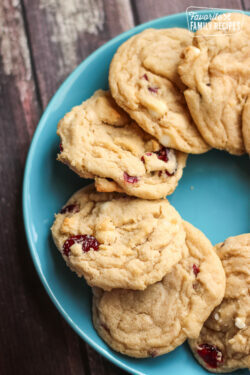 This recipe makes just about 8 large round cookies – approximately 5 inches in diameter. I almost always double the batch. Blend the butter, sugar and egg together, then add baking powder and soda and almond extract or vanilla. Add 2 cups flour slowly mixing it into the other ingredients. If it seems to sticky, add a bit more flour. If the dough still seems too sticky to roll out, you can pop it into the fridge for 15-20 minutes. Sometimes it’s easier to roll out dough that is more firm. Sprinkle some flour on a cool surface. Flatten the dough into a one inch thick round circle. Lightly flour the top of the dough, then roll the dough out to about 1/8 to 1/4 inch thick. Careful not to roll them too thin! Using cookie cutters, cut your dough into shapes and place them on an ungreased baking sheet. Then repeat until all the dough is gone. Bake at 375 for 10 minutes. Don't overcook. Cream butter and cream cheese together with a hand mixer or in a stand mixer. Add drained raspberries and vanilla and almond extract. Slowly mix in the powdered sugar. The mixture may seem dry at first but the juice from the raspberries will blend in making it the right consistency. If it is still too thick, add in some of the drained raspberry juice. If you are using a 3 to 4 inch cookie cutter, this recipe will make about a dozen cookies. The recipe can be doubled or tripled for more cookies. What a great twist on the frosting, love it! I bet that frosting is fantastic. 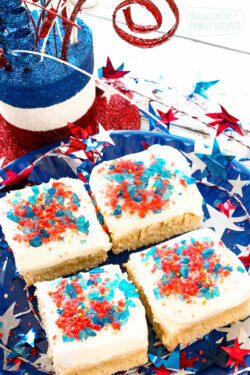 It sounds like a great twist on the regular sugar cookie. What a fabulous and unique frosting idea. I am loving it. Definitely going to give these a try. I am your newest follower. How much flour do you use for the cookie mix? 2 cups, sorry, it was in the instructions but not the ingredients list. I fixed it.